Today the church celebrates Trinity Sunday, the core Christian belief that God is three Persons in one divine nature: the Father, the Son and the Holy Spirit. The Trinity is a deep mystery that we can scarcely fathom yet know to be true according to the Scriptures (e.g., Gen. 1-2; 18:1-15; Ex. 3:14, Jn 14:1,5; Deut. 4:32-34, Ps. 33; Rom. 8:14-17; Matt. 28:16-20). Historically, the church has depicted icons of the Holy Trinity such as the three winged Persons in The Icon of the Hospitality of Abraham. It may seem odd to offer a resurrection painting to reflect on the Trinity, but American artist Bruce Herman’s Riven Tree offers an excess of meanings. Herman’s title shares the theme of “riven-ness” with the poem "Every Riven Thing" by Christian Wiman. “Riven” means “split or torn violently” and both poem and image are imbued with wonder over God’s making and unmaking, brokenness and belonging in the midst of mystery. When Dr. Richard Hays, the former Dean of Duke Divinity School, commissioned a resurrection work, Herman was struck by the challenge. According to Herman, resurrection paintings rarely range among great works of art. Something ineffable yet essential to the resurrection seems absent even among the masters’ works. The Gospels do not tell the moment of the Jesus’s resurrection. The resurrection is a hidden noise, known but not open to for public consumption. While Jesus is honored by all, by his divine nature, the Son’s triumph is a Godhead event: The Father, the Son and the Holy Spirit form a unique community in action and adoration. Riven Tree depicts a theology of trees in Scripture to advance a compelling vision for humanity and creation through the creative and dramatic destruction of the Cross, God’s architecture of resistance to humanity’s greatest enemy: death. While the bodily resurrection of Christ is central to the birth of the church, the very hiddenness of those first moments led Herman to reach beyond the human form for a symbol that captures the meaning behind the experience. Whereas typical resurrection paintings show an isolated, individual event with Christ alone, Herman’s Riven Tree is layered with symbols. 5. Jesus Christ is the Tree of Life: The vertical shaft of gold is the ladder that bridges heaven and earth and restores humankind to God. Christ is the mysterious Fifth Element: the “Ether” (the quintessence), in which all the Elements are held together (Col. 1:17). Through a theology of trees, Riven Tree promises that all time, all places and all people are gathered back to God. Now, as we celebrate the Trinity this Sunday, may we remember the meaning of the Resurrection journey with the Father, the Son and the Holy Spirit. 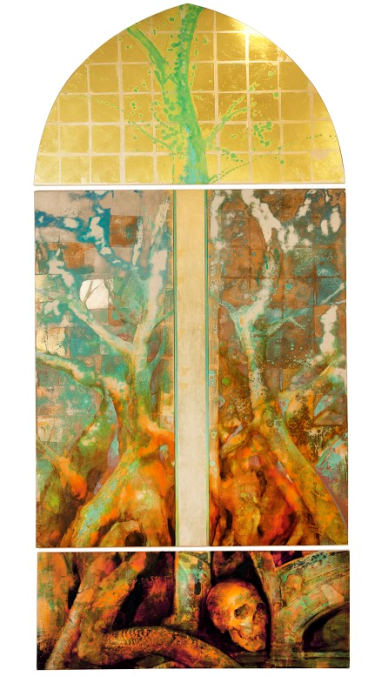 Bruce Herman, Riven Tree, 2016 triptych in oil and alkyd resin on wood with 23kt gold, platinum, and silver leaf. Bruce Herman is a painter, and Professor of Art at Gordon College, near Boston, where he is currently Lothlórien Distinguished Chair in the Fine Arts. Herman’s artwork has been exhibited in over 100 exhibitions in major cities in the United States (Boston, New York, Chicago, L.A.) and abroad (England, Italy, Israel, Japan, Hong Kong). His work is housed in many private and public collections including the Vatican Museums in Rome; Grunwald Center at Armand Hammer Collection, L.A. County Museum, Cincinnati Museum of Art, and the DeCordova Museum. Alexandra Jean Harper is the Creative Director for Culture Care, a ministry department of Artists in Christian Testimony International (A.C.T. Intl). Her work equips the local church to show Christ in creation, creativity and artistry. She received an M.Div in Apologetics at Southeastern Baptist Theological Seminary in Wake Forest, North Carolina. She then went on to receive an M.Litt in Theology, Imagination and the Arts at the University of Saint Andrews in Scotland. She has interned with the artist Makoto Fujimura as part of the Fujimura Institute based in New York City. She lives in Durham, North Carolina, USA. For more information, see www.culturecarerdu.com.